It's hard to overstate importance of Ranma ½ to the U.S. anime fandom. Long before Dragonball Z or Pokémon, Rumiko Takahashi's martial arts comedy about a boy who changed genders whenever he's hit with hot or cold water created the first wave of anime fans who actually knew the word anime. 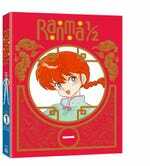 And now Ranma ½ is back, remastered on Blu-ray! By the way, check out the video above of how much better Ranma ½ looks, thanks to Viz' s restoration! It's pretty impressive, especially since Ranma ½ first aired in 1989. Anyways, the set contains the series' first 23 episodes — a few more than the first season. Official synopsis: "When Shaggy and Scooby win tickets to WrestleMania, the entire gang travels in the Mystery Machine to WWE City to attend the epic event. However, when a mysterious ghostly bear appears and threatens to ruin the show, Scooby, Shaggy, Velma, Daphne and Fred work with WWE Superstars to solve the case." There is nothing about these two sentences I don't love. Containing: 1) Untamed Youth, a ridiculous '50s tale of teens arrested and sent to work on a brutal farm, but was mainly an excuse for guys to ogle Mamie Van Doren. 2) Hercules and the Captive Women, a delightfully goofy sword-n'-sandals flick. 3) The Thing That Couldn't Die, a truly ridiculous '50 horror flick with no horror whatsoever in it. 4) Pumaman, one of the finest episodes in all of MST3K history, a superhero movie of Manos-level ineptness which seems to believes pumas can fly. This set is completely worth it for Pumaman alone. The Canadian/Syfy series which is basically Timecop for the 21st century, i.e., more intrigue, more violence, and terrorists. Feel free to correct me in the comments. The first 11 episodes of the show, set after the hit movie. Can I say how much I'm looking forward to the movie sequel? I assume someone has a ton of nostalgia for Yu-Gi-Oh at this point. Here you go, someone. I have no idea if anyone has nostalgia for Winx Club; actually, it seems kind of unlikely. But just in case, here, they finally got around to releasing season sets. I'm not sure how I missed this, but BBC's light-hearted fantasy came out last week. While searching for his missing father, a young man named Jason manages to wash up on Atlantis, which is where all the Greek myth are hanging out. Starring Robert Baratheon as Fat Hercules, which is kind of awesome.